We visited Efisio and Cetti at Sa Tuerra, their home immersed in the nature, few minutes away from the stunning SP 71, listed among the most beautiful italian roads. Cetti: back in the ’80 my dad had the chance to buy a small ancient house, it had just two rooms , a stable and a tool shed. He felt immediately in love with this place, thanks to its citrus trees, the tall mediterranean bamboo as wind shields and so close to such a beautiful sea. 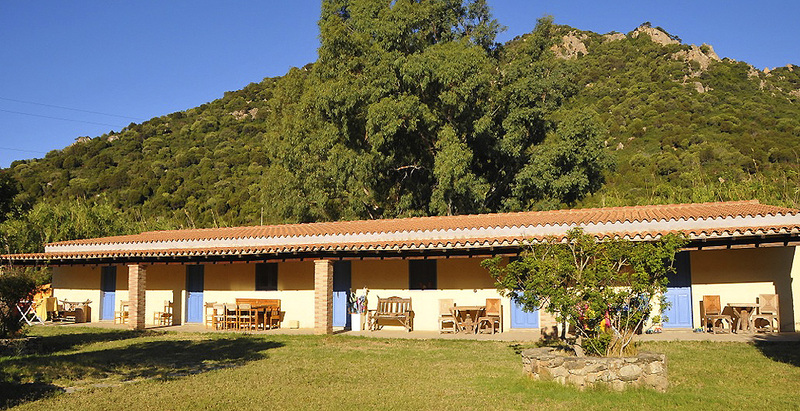 It was exactly a buen retiro, in a authentic and simple Sardinia, far from the noise of mass tourism. Still now, under a starry sky listening the hypnotic frog’s croak, I’m conquered by the rhythm of nature and in peace with life. What’s Hospitality in your opinion? Efisio: we’ve always had friends at home, we love staying together with friends. In 2000 we’ve decided to start the B&B Sa Tuerra, a place without noise, pollution, tv. In compensation lots of talks and laughs among guests, that became friends and feel at home. Some guests even feel scared by the silence, but the following morning they enjoy breakfast with our cakes, fresh ricotta and orange honey, talking about the several beaches they keep discovering along the coastal road. At evening, we sat under our pergola, with a glass of cold local mirto liqueur This is what we want to give to our guests. Our ideal guest is the one that want chill down, experiencing a real vacation. The one that likes an active holiday and able to appreciate this nature. I’ve got three at least! The tower of “Su Portu de S’Arena” beach, which is in our logo. Then the marvelous Tuerredda, the Caribbean looking beach at km 9 of SP 71 road. And “Is Cannoneris” forest, the biggest oak forest of Europe, a paradise for hikers, bikers and horse riders. A day by boat to Porto Zafferano beach, or by bike at the white sandy dunes of “Is Arenas Biancas”. Then a visit to the Carignano vineyards of Santadi, and for sure the local “pane&pomodoro”, bread baked with tomatoes inside, that reminds of pizza but has a distinctive taste. The Sant’Efisio celebration in Cagliari on may the 1°, with the big ox pulling the traditional carts, the magical sounds of launeddas, the horseman and the colorful Sardinia costumes, until the cascade of flowers over the Saint.